The female uterus is a complex reproductive organ with a unique anatomy. The basic structure is made up of layers: the outer-most layer is called the peritoneum and surrounds the thin, fluid-secreting perimetrium layer. Next is the myometrium, which consists of smooth muscle. The inner-most layer and lining of the uterine cavity is called the endometrium. The entire uterus is surrounded by an intricate system of blood vessels. The outer lining of cells of the endometrium sloughs off periodically if the female does not become pregnant; this shedding is responsible for menstrual bleeding. 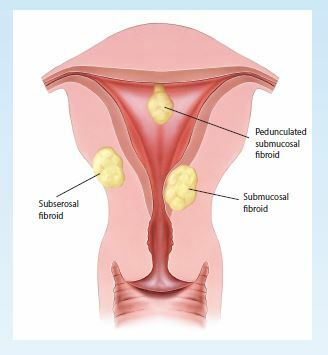 Uterine fibroids (also called leiomyomas) grow from the smooth muscle and can be found on the peritoneum, within the myometrium and on the endometrium. These fibroids are non-cancerous growths which often develop during childbearing years, after a woman has gone through puberty. Although the exact cause is unknown, it appears that the hormone estrogen, which helps regulate the menstrual cycle, plays a key role in their growth. Uterine fibroids are extremely common, affecting many women at some point in their lives. Most of the time, uterine fibroids can be so small they do not cause any physiological problems and go unnoticed. Fibroids can also grow very large, possibly filling up the uterine cavity and weighing several pounds. As long as a woman with fibroids is menstruating, a fibroid will probably continue to grow. When estrogen levels fall after menopause, fibroids can shrink. Uterine fibroids can cause multiple complications with pregnancy but it is not common. Sometimes, fibroids can make it difficult to become pregnant, creating infertility. During pregnancy, existing fibroids may grow due to the increased blood flow and estrogen levels. Large fibroids in the uterine cavity can cause abnormal fetal positions and placenta problems. If fibroids block the birth canal then a cesarean section delivery may be necessary. Uterine fibroids increase the risk for miscarriage, and premature labor and delivery. Pain and excessive bleeding after childbirth are also seen. There is no single, best approach to uterine fibroid treatment. Medical treatment is usually only sought when symptoms are too severe and pose health risks. If you have uterine fibroids with little or no symptoms or are nearing menopause, it is typically recommended to have regular pelvic exams to monitor the fibroid growth and symptoms; this is often referred to as watchful waiting. 1. Jabbour HN, Sales KJ, Catalano RD, et al. Inflammatory pathways in female reproductive health and disease. Reproduction. 2009; 138:903-919. 2. Flake GP, Andersen J, Dixon D. Etiology and Pathogenesis of Uterine Leiomyomas: A Review. Env Health Persp. 2003; 111(8):1037-1054. 4. Maybin JA, Critchley HO, Jabbour HN. Inflammatory pathways in endometrial disorders. Mol Cell Endocrinol. 2010; [Epub ahead of print]. 5. Sozen I, Arici A. Interactions of cytokines, growth factors, and the extracellular matrix in the cellular biology of uterine leiomyomata. Fertil Steril. 2002; 78(1):1-12.